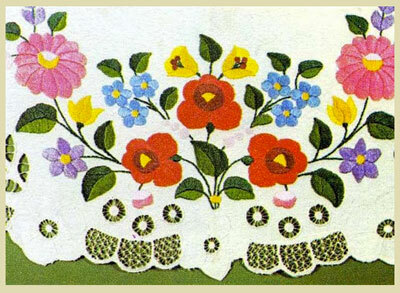 The folk embroidery of various countries fascinates me, so I was happy to see a recent post on The Textile Blog about Hungarian Flower Embroidery. The folk embroidery of Hungary is quite colorful, and, in its simplicity, I find it very appealing. After perusing the article on The Textile Blog, I found myself meandering about online, ending up at one of my favorite resources for online books. Have you ever visited the On-Line Digital Archive of Documents on Weaving and Related Topics? It’s a hefty title for a website. I just call it the Digital Archives. There, you will find some terrific books on all kinds of textile-related subjects. I found a couple books on folk art in particular, and both books feature some beautiful folk embroidery, needlelace, and related textile goods. Both of the books I found myself browsing through are by author Charles Holme. The first is Peasant Art of Austria and Hungary, and though it covers more than just textiles, much of the content is dedicated to peasant costumes, embroidery, and needlelace. 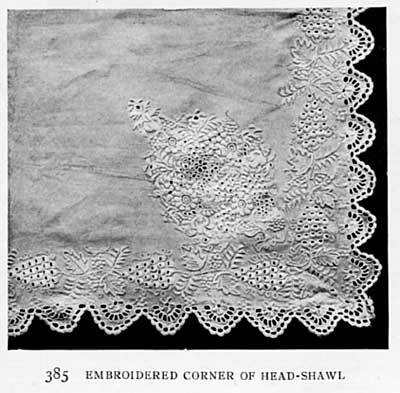 Various items of the peasant costumes from Austria and Hungary are featured throughout the book, like this head-shawl, adorned with beautiful eyelets, cutwork, and textured embroidery. 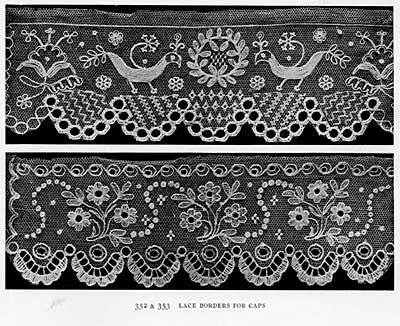 The hand-made laces – like these two laces embroidered on net ground – are a terrific source of inspiration for surface embroidery patterns of a folky nature. I love those birds! 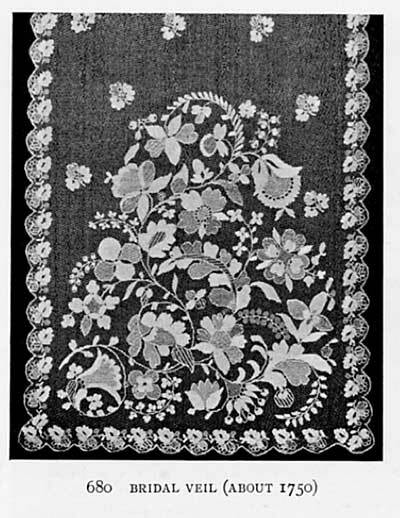 Though the types of needlework make both pieces look completely dissimilar, note that there are some elements in the flower designs that are look somewhat similar. I like both of these designs – the veil is certainly more elaborate and “formal,” while the surface embroidery is simpler and somewhat “casual,” but they’re both beautiful in their own right. 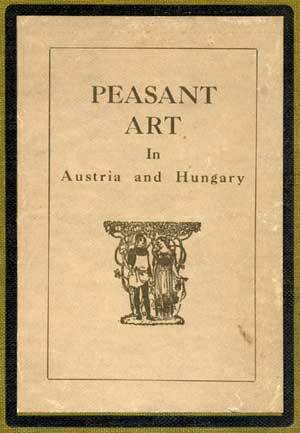 The other book by the same author is called Peasant Art in Italy. Can’t you just imagine this nice piece of crisp linen embroidered in bold blues or reds and adorning a tea table? But what is that description under the photo? 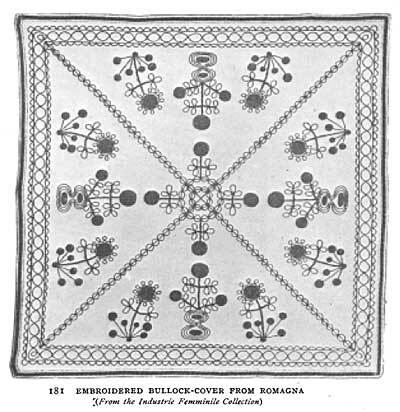 An embroidered bullock cover? Are they kidding? What do they mean – I mean, really… what DO they mean? Surely, they wouldn’t really cover a bull with that. And so you see that a visit to the Digital Archives is always a learning experience! I’m glad I don’t have cattle. I might be tempted…. This weekend, if you’re looking for a source of inspiration, some good reading on textile-related subjects, or just in the mood to browse good books, visit the Digital Archives. You can find these two books under the “H” section, by the author’s last name. LOL!!! Mary you made me laugh! Thanks – I needed it. Beautiful stuff. I just can't imagine why you would put an embroidered cloth on a bull. But there you go. Mary – you have made my weekend! I shall abandon my plans to continue working on three, small, dainty, crazy quilt bags and start thinking about what to embroider on a bullock cover instead…My daughters-in-law can wait while the local bulls had better duck for cover unless they want the embarrassment of being the first New Zealand beast to be so outfitted. I shall explore the Digital Library when I have a few hours to spare. It may provide other interesting and thus far unthought of inspiration. Guess I had better finish the bags before starting something new. Sigh. I have learned to stay far, far away from the Digital Archives because I know I will lose at least five hours of my life in the blink of an eye. I get sucked in. I don't know if this will make it make more sense to you or not, but a bullock and a bull are not the same thing (I'll let you look them up because the difference is not genteel ;-p). Suffice to say, you wouldn't go close enough to most prize bulls to put that cloth on its back :-O! Steers, on the other hand, rhyme with dears for a reason. And this book is amazing! Well, I am from Hungary, and it was a pleasant morning surprise to read about my own country's embroidery. Actually, there are many styles of embroidery in Hungary, the two most beautiful surface embroidery styles are "kalocsai" and "matyó". The ladies in the past had beautifully stitched folk costumes too. Is I am mostly do cross-stitching, I must add, that we have got beautiful folk cross stitch patterns, too. Maybe some time later I gather a few pictures for you to see. In India in Gujarat which has a rich and varied tradition of embroidery bull covers are made by the nomadic communities using techniques like applique, beadwork, aari or tambour work etc. It's a google-made translation, some things are a little difficult to understand! Hi, All – thanks so much for your comments! Erica – you and I are in the same boat, I suppose. I really want to jump into a new project – something of a folk-arty design – but I'm tied to a … a….. a ROOSTER. Hi, Karen – heh heh. I thought a bullock was just a young bull. I suppose certain anatomical differences between the bullock and the bull might make it easier to dress one up for special occasions. Jayashree – I would love to see pictures of that! I'll look around online to see what I can find. I suppose every country has its traditional festive decor for their various prized animals! In the American west, horses and saddles used to get a lot of attention, though I don't know if that's still the case. KerGiz! Good to see you again! I love the embroidery of Hungary and that area of Europe. I have a Romanian student who brought me some gorgeous photos of the native costumes worn by his relatives at their weddings – the embroidery was so colorful and so abundant! A wonderful tradition! Hi, Silvia! Thanks for the link – I read the article. It sounds as if the covers were made from a heavy fabric, actually with braid that was couched on, rather than embroidered through the fabric? Very nice of you to find the information and send the link! I appreciate that! Tania – glad you got a good chuckle! I can't quite imagine it myself. But I suppose it's very festive looking when the carts are painted and oxen are covered! It would be neat to see in real life. Oh, yes, Magpie – you and me both. I can easily squander a whole afternoon at the Digital Archives. It doesn't look as if any new books have been added recently, though, so I didn't hang out there too long this time! Thanks again for your comments! Have a wonderful weekend! I am just finishing up a stumpwork design of my own and was wandering, and came across a comment on Norwegian rosemaling.And did some reserch! It's beautiful,and colorful!